At 8 weeks old, your baby has been a part of your life for two months. This is the point where you begin to see some obvious changes in your baby and very quick developments. You and your baby are easing into a daily routine and you begin to know what works and what doesn’t. You may begin to have set daily rituals like morning cuddles, bath time, walks outside, and visits with others. With an 8 week old baby, life begins to seem quite normal now. Your parenting style with your 8 weeks old baby is your own and that is just fine. At this time, you may still feel a little nervous as a parent, but your baby doesn’t have a clue that you are less than experienced. As long as they are getting what they need to eat, getting their diaper changed when needed, and cuddles every day, you are doing fine. Try to incorporate new things one at a time. This article will help you understand the needs and changes you will be seeing in your 8 week old baby. At 8 weeks old, baby will need to eat about 6 times in a 24 hour time period. This is one of the major growth spurt times and your baby may want to eat more often. It is normal for breastfed babies to want clusters of feedings later in the day. You may even question if you are making enough milk, but your baby is making sure that you are. Breastfed babies are getting enough if they have at least 6 wet diapers a day and seems alert and content. Bottle fed babies may devour the entire bottle and still seem like they are hungry. Your pediatrician can tell you how many ounces your baby needs for this age. Do not try and make formula stronger than the recommended mixture or add cereal to the bottle. Around the age of 8 weeks, babies tend to start to sleep on a regular schedule and are awake a little more often. They may even start fighting sleep because they are so interested in their new world. There is no guarantee that babies this age will sleep in normal patterns and that you can force them onto a sleep routine. Some will, but some won’t. Despite them fighting sleep, you can still lay them in their crib while they are still semi-awake to teach them how to fall asleep by themselves. If you always put them in their crib fully asleep, they may not learn how to settle themselves into sleep and want you to always rock them to sleep. At this age, it can be really hard to push the issue. You may notice at 8 weeks that your baby cries a bit more than during the first weeks of life. It may even seem like there is something wrong and the crying makes it seem like they are in pain. At 8 weeks old, baby is most likely just tired and overstimulated. This type of crying tends to be more noticeable in late morning or afternoon. When crying persists more than a few days, it may make you frustrated because you can calm them down. If you are a new parent, talk to your pediatrician about ideas for soothing your baby. They may have brochures or suggest a good book with helpful tips. It is also helpful to talk to other moms who have been through the same thing. Newborns can normally only see two-tones and bright colors. By 8 weeks, they are starting to see more details in the world. They can now see different shapes and colors. Offer your baby different items with new textures and shapes. Things around the house like balls, stuffed toys, and colored cookie cutters make great baby toys. You can also hang bright posters on the walls of his or her room. Babies at 8 weeks now know your voice from daddy’s, brothers, or other close family. They also tune in and listen to what is going on around them. They respond and will turn their head to different sounds. Talk to your baby often, they are listening now. They will be hearing your tones, watching your mouth and responding in their own little way. It helps to stimulate brain development and bonding. If your baby does not seem to be responding, let your pediatrician know so they can do an easy hearing test. Smiling usually starts around 6 or 7 weeks, but they are far and few between. By the 8th week, they start smiling at just about everything and these are true grins of happiness. 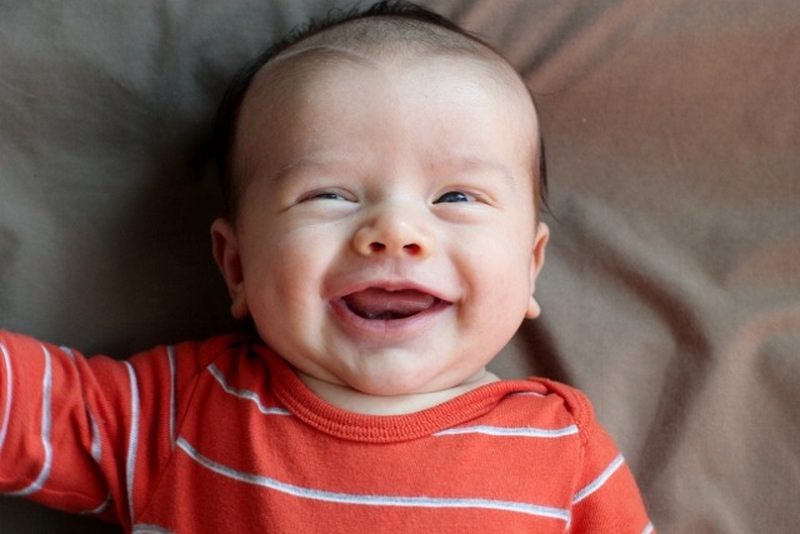 It is perfectly fine if your baby has not smiled yet, it could take up to the 12th week to see those gummy grins. Get your cameras ready! Along with increased periods of being awake and alert, your baby is now more active. They seem to move their arms and legs with coordination. When they are laying on the floor, they kick their legs and wave their arms. This helps build muscle tone and prepare them for crawling and then walking. Since hearing is becoming more refined, introduce your baby to music this month. You will notice the response from them as they kick their legs in rhythm to the music. Fast music may make them very active, while soft music may cause them to listen and relax. Sing along to children’s tunes and your baby will remember them for years to come. If you notice your baby gets fussy, give them a break. Sometimes a 9 week old baby tolerates the stimulation of music a little better. Be prepared for a fussy baby for the next 48 hours. You may notice a mild temperature, redness, and swelling at the site of the injection. The pediatrician will give you information on what to watch for after immunizations.